During our last night in Bangkok, I was contemplating what to do the next day. We still had a full day to spend in Thailand before we fly back to Manila. I heard that the floating market had already become too touristy so I decided not to go there anymore. Moreover, since we had just returned from Laos, my sister already felt ‘temple overload’ and told me that she doesn’t want to visit any temples anymore. 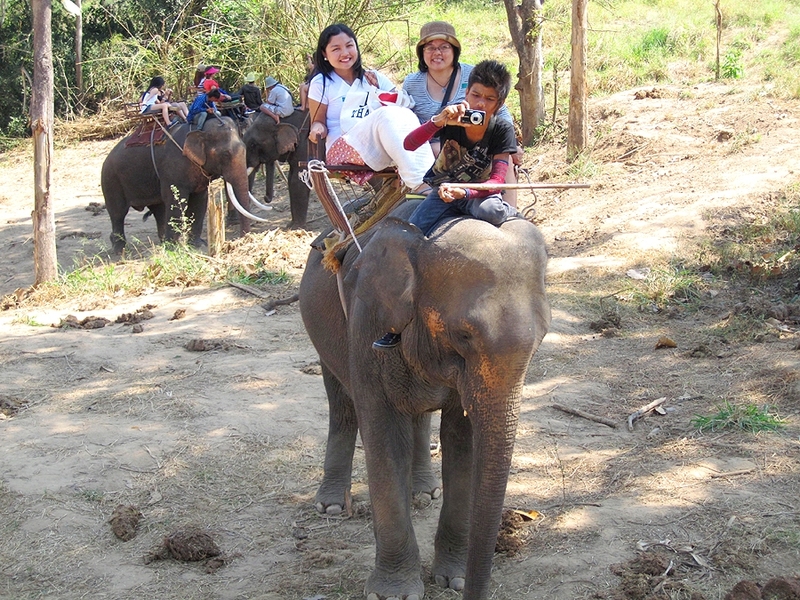 So to give my mom and my sister a different and memorable adventure on our last day in Thailand, we decided to go elephant riding in Kanchanaburi. Where the hell is Kanchanaburi by the way? I had also never heard of the place before coming to Bangkok. 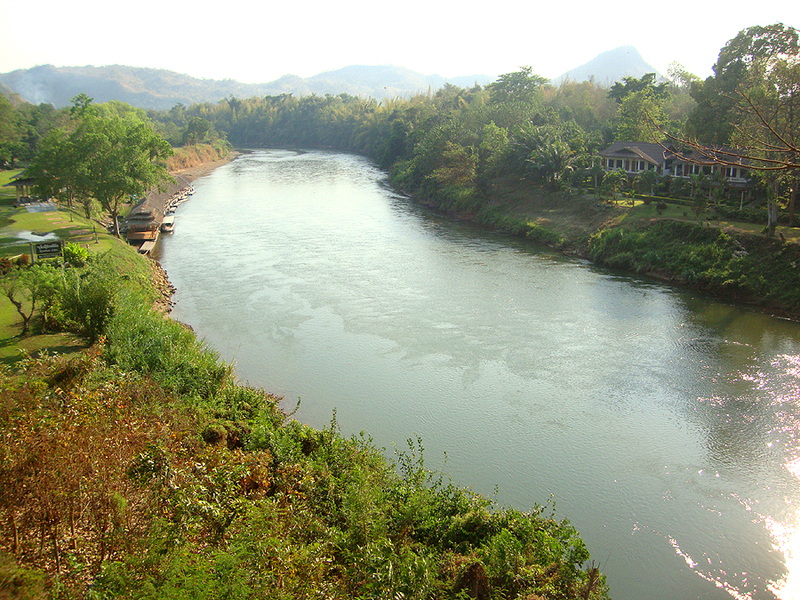 Kanchanaburi Province is located in western Thailand and is situated 129 km from Bangkok. Travel time from Bangkok would take around 2 hours by car. 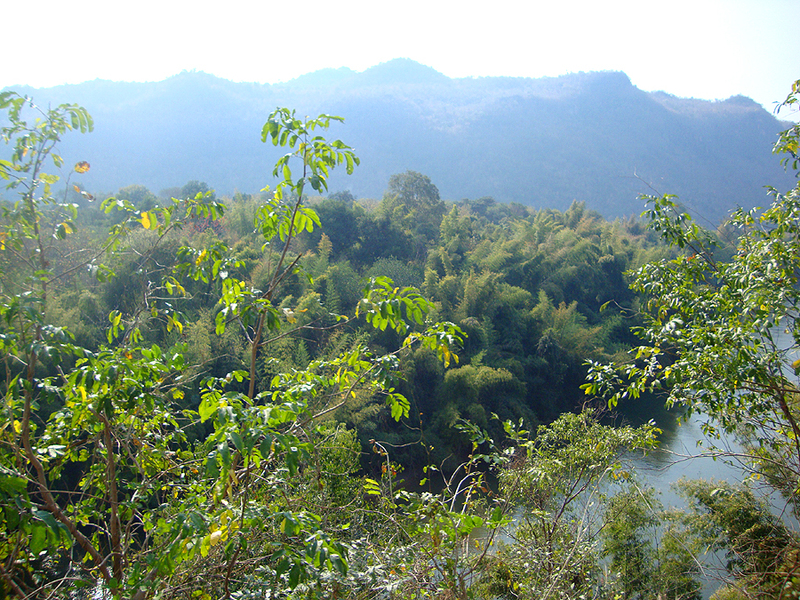 The province is filled with rainforests, mountains and rivers. 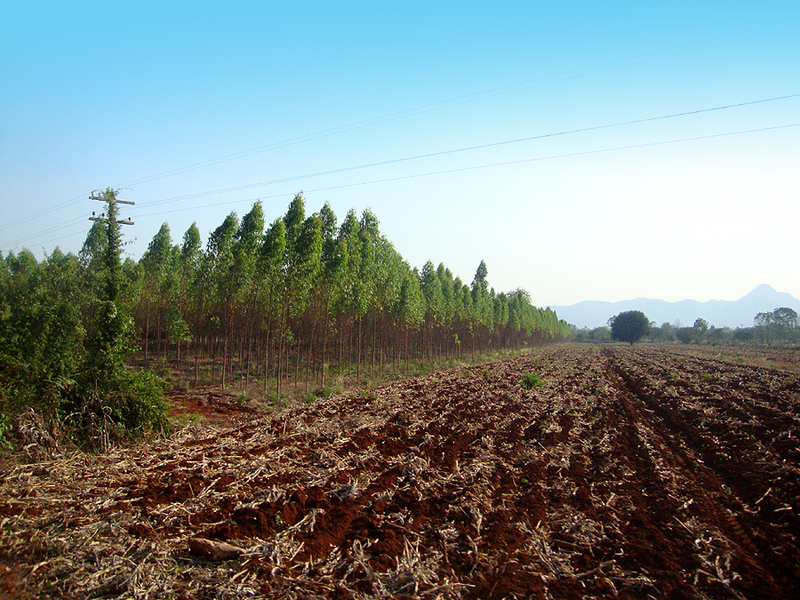 It is popular for travelers who want to get away from chaotic Bangkok and experience the countryside for a while. 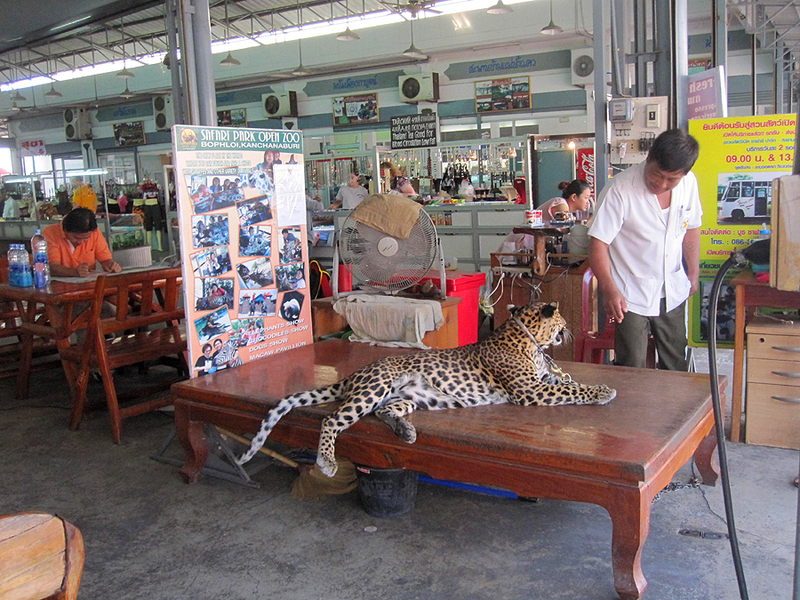 We heard this tour from the travel agency of our hostel, Sawasdee Bangkok Inn. 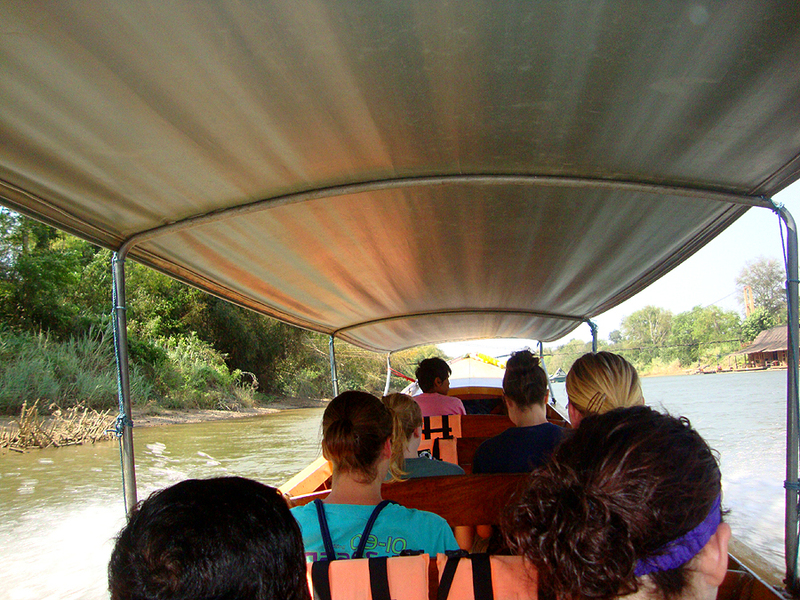 They offered us a day tour to Kanchanaburi for 1,172 baht (Php 1,642) per person. 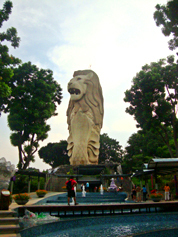 The tour is inclusive of everything such as transportation, food and tour guide. 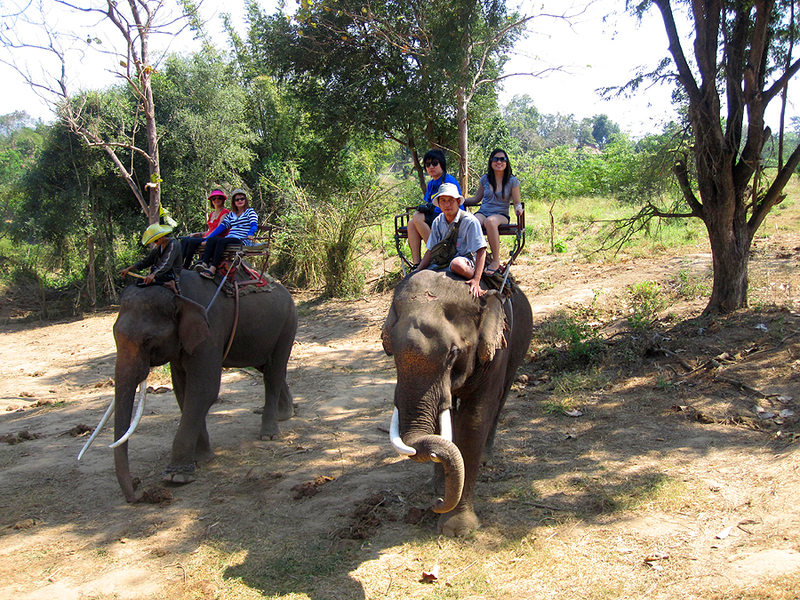 Aside from elephant riding, the tour also includes bamboo rafting and a visit to some historical sites in Kanchanaburi. We were picked up by the travel agency’s van from our hostel early in the morning. We left Bangkok at around 7am. The van was full and joining us in the tour were a Filipino family and American ladies. The drive to Kanchanaburi was a bit long. 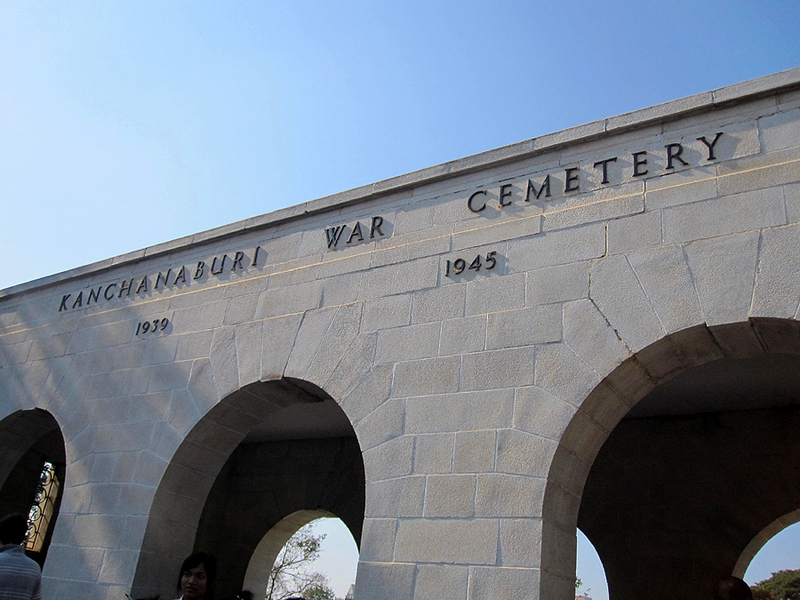 We finally reached the province after two hours on the road and our first stop was the World War II Cemetery. 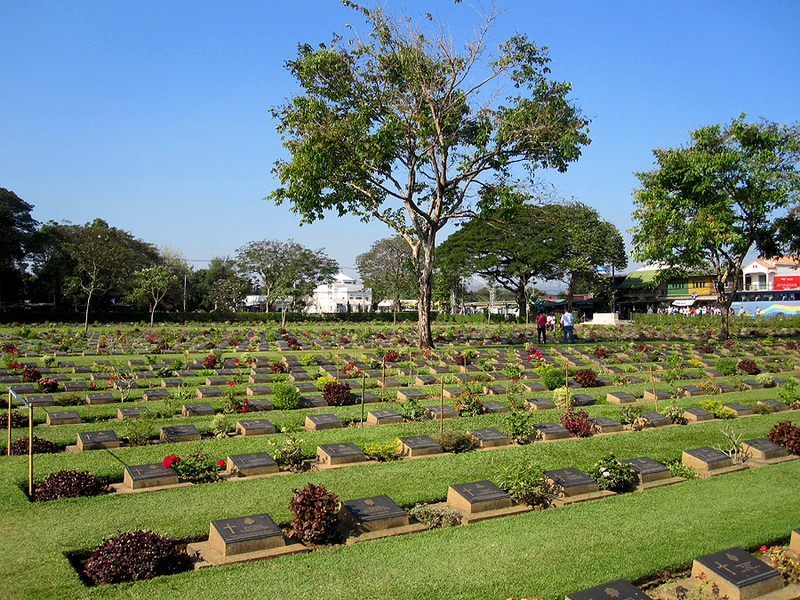 The World War II Cemetery was where the remains of 6,982 Australian, Dutch and British prisoners of war were buried. 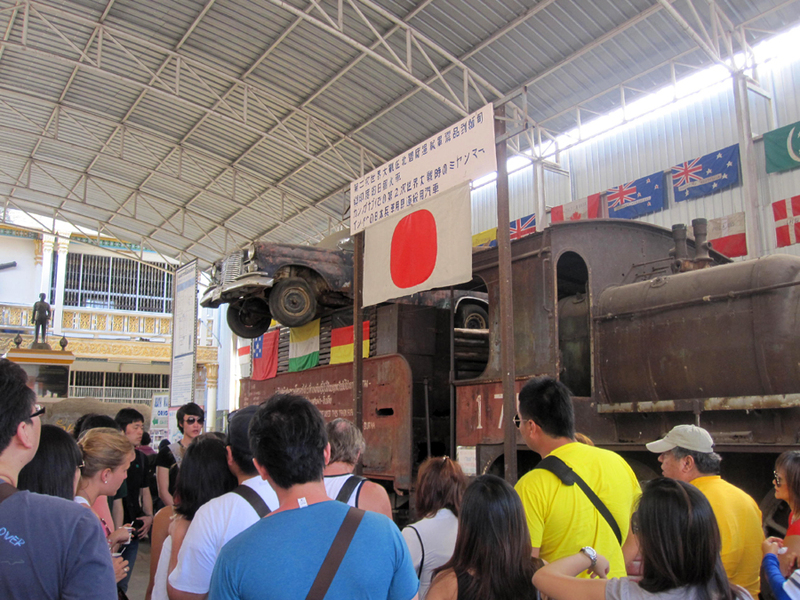 They lost their lives when the Japanese Imperial Army forced them to build the 415 km long Thailand-Burma railway. The Japanese wanted to maintain their forces in Burma (now known as Myanmar) and bring in war supplies from Thailand so they started to build the railway. They forced Asian laborers and prisoners of war to build the railway despite the difficulty of constructing it because it traversed deep valleys, mountains and rivers. And because manual labor was used, a lot of people lost their lives building the railway which was the main reason why it is also called as the Death Railway. 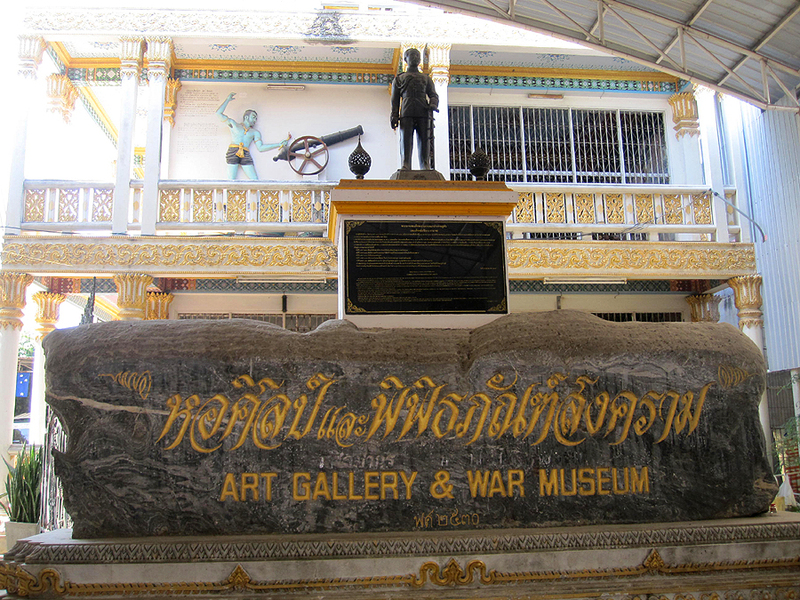 We also dropped by the Art Gallery and War Museum which contains remnants of the World War II. Admission fee is 40 baht (Php 56) per person. We were actually feeling hungry so we didn’t go inside the museum anymore and we just went to a nearby eatery beside the museum. I ordered iced coffee and yummy Thai noodles for our late breakfast. 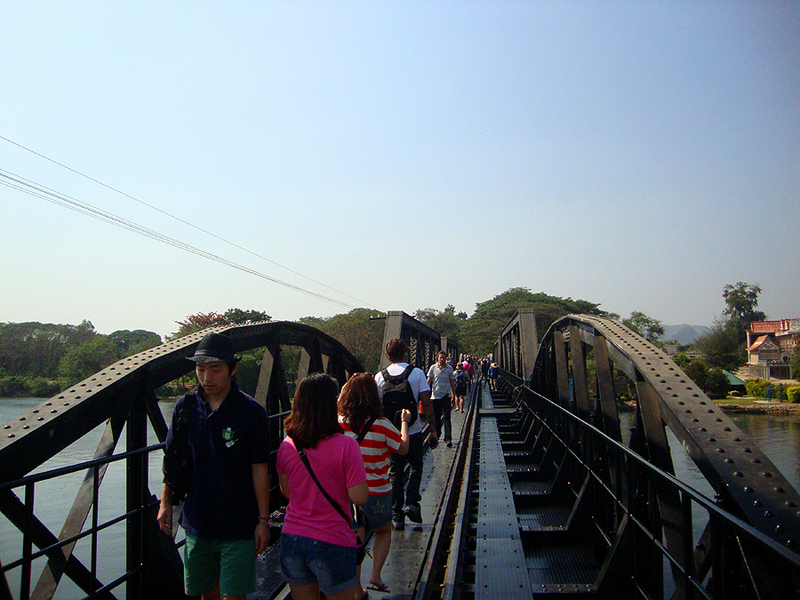 After eating, we walked a few meters to see The Bridge over the River Kwai. 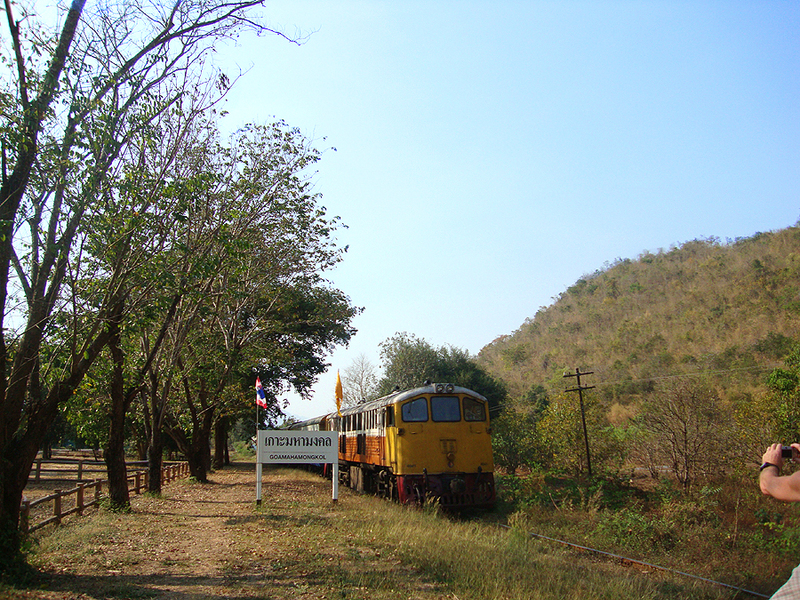 This is the most popular part of the Death Railway because the story of the bridge was used in the movie “The Bridge on the River Kwai”. This classic film has been considered as one of the greatest films in motion picture history and it depicts the construction of the Death Railway in World War II. The movie won several Oscar awards including Best Picture in 1957. 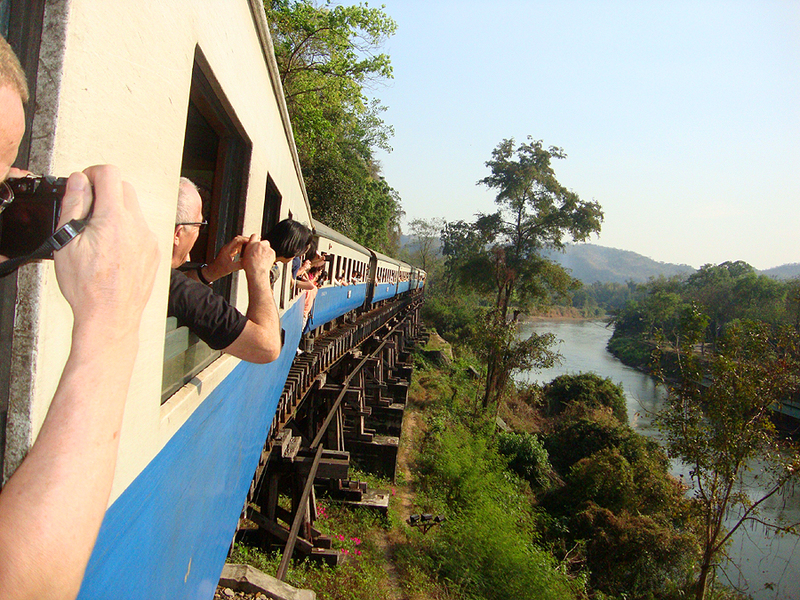 I have never seen the movie nor heard of the Death Railway before coming to Thailand but it was interesting that we were able to visit a famous historical landmark through this tour. It was also saddening to know that thousands of lives were lost in building this Thailand-Myanmar Railway in World War II. Talk about the ugly consequences of war in our history. After visiting the bridge, we drove to a nearby valley and came my most awaited part of this tour. 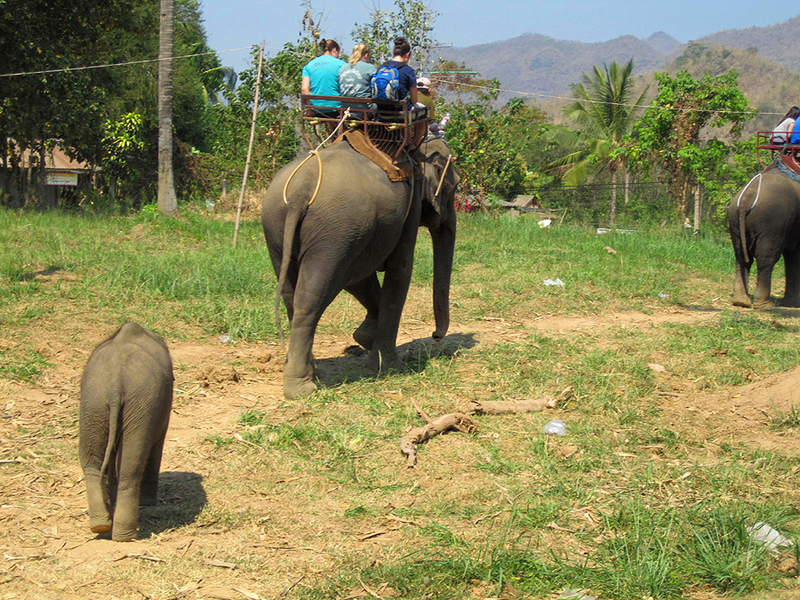 It’s time for some elephant trekking! I was so excited when I finally saw the elephant camp. 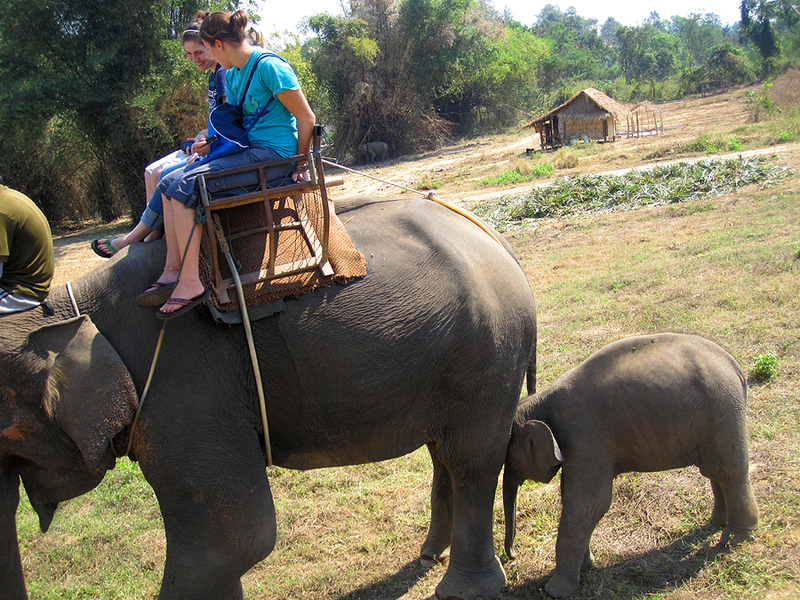 It was one of my dreams to ride an elephant so I was looking forward to try this in Thailand. 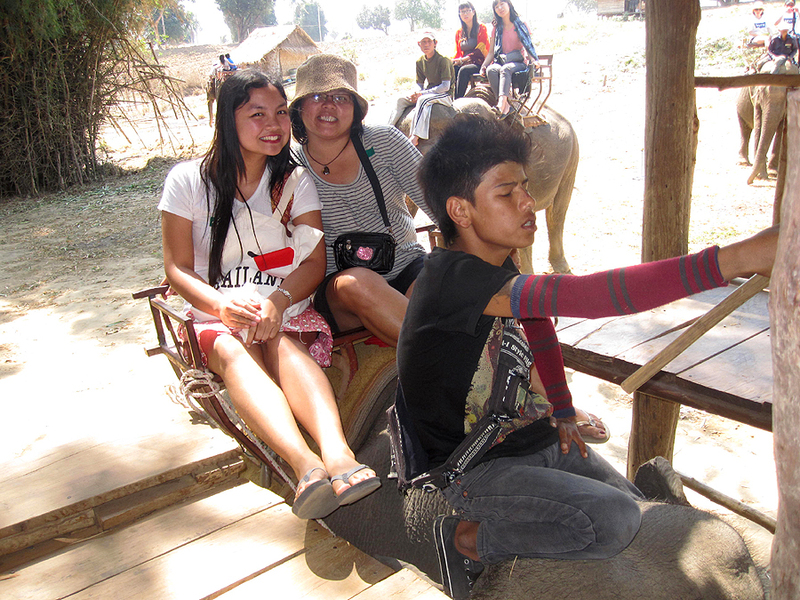 My mom told me that she didn’t want to ride the elephant anymore because she had already tried it in Cambodia. 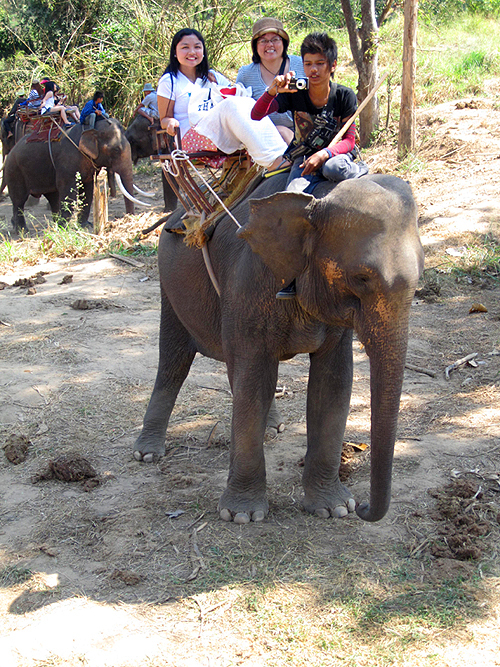 Hence, it was only my sister and I who joined the elephant trekking. We went up the platform right away and waited for our turn. 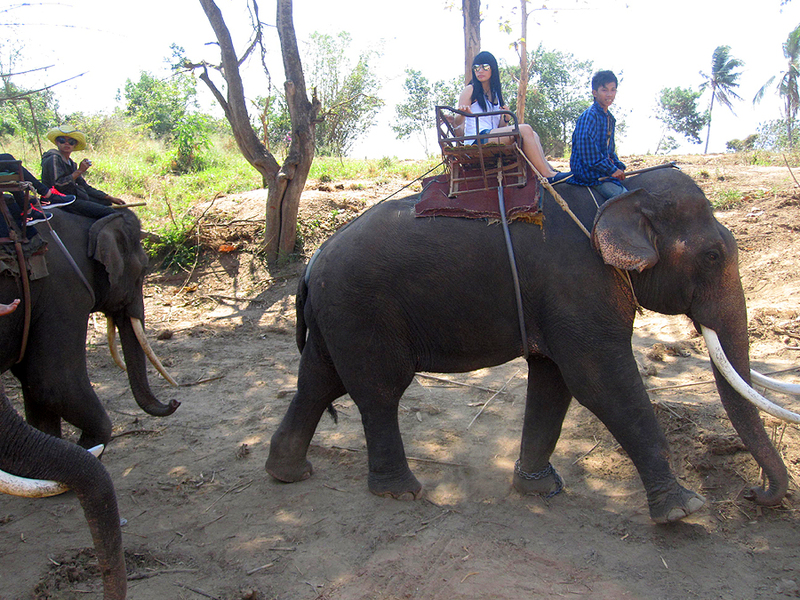 To our surprise, the smallest elephant was assigned to us and the huge elephants were with the skinny girls. As you know my sister and I are quite big, so I was actually concern if the poor elephant could carry us. I asked the the guide about it and he said that we should not worry because the elephants are very strong and they could surely carry us. We started the trek and the ride was bumpy and uncomfortable. 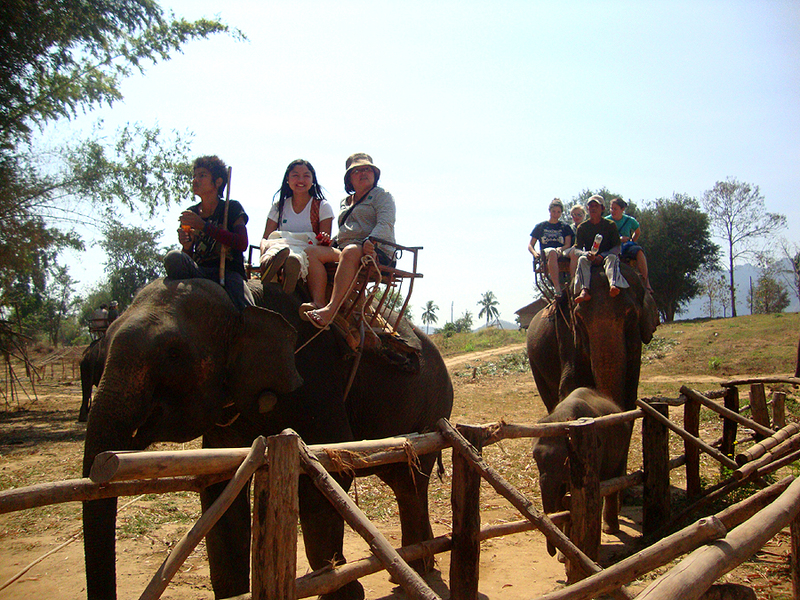 Honestly, I was so afraid that I would fall down from the elephant’s back so I held on tightly on my seat. We also talked with our guide for a while. He’s a young boy and I think he’s the youngest among the guides. 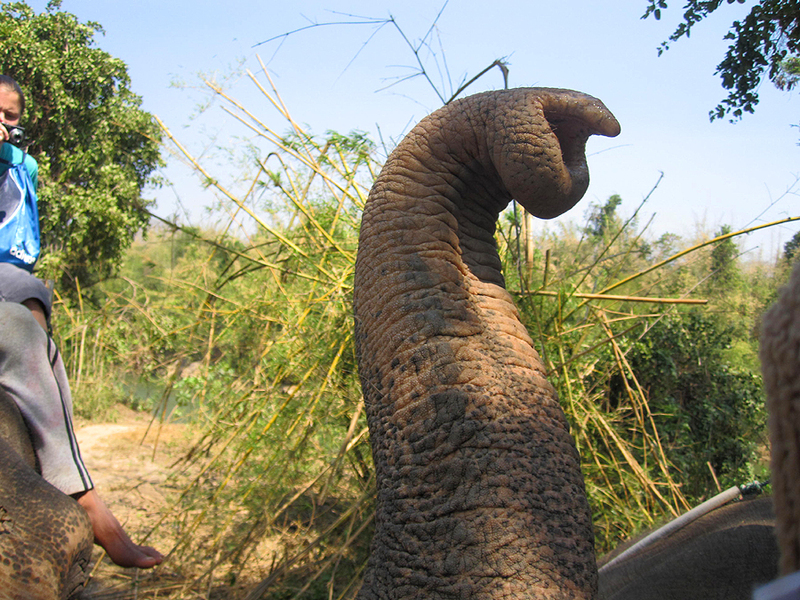 He said that he doesn’t go to school anymore and he already grew up in the elephant camp. 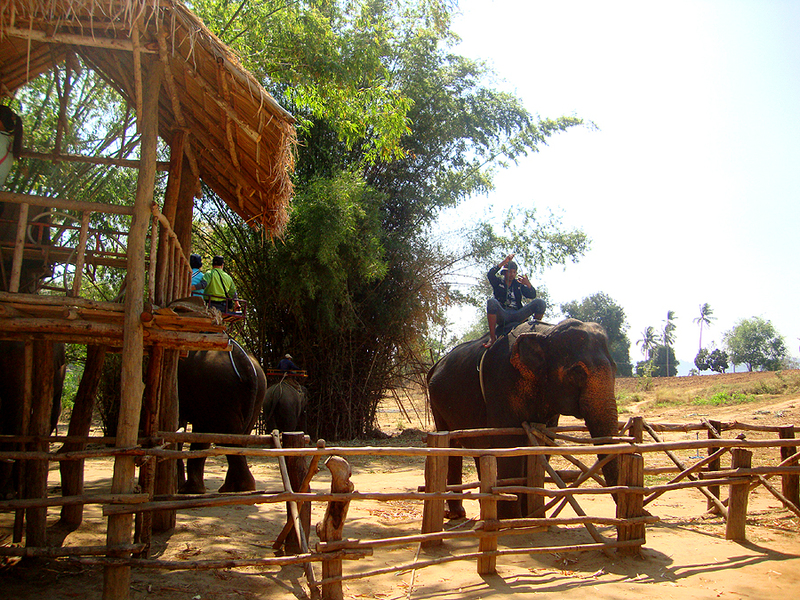 He also told us that he and the elephants don’t have any day off because they work everyday. I truly can’t imagine that. It must have been pretty exhausting for him and the elephants. 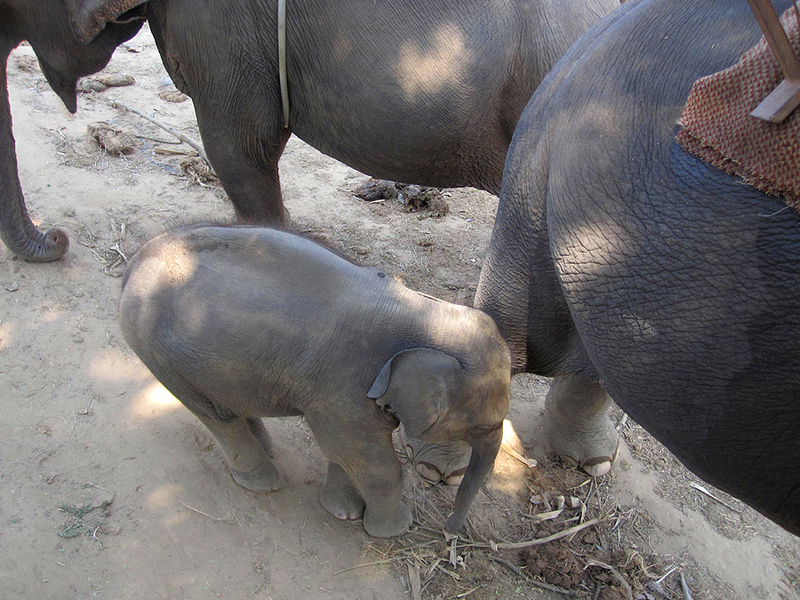 We also saw this cute baby elephant who kept on following her mom all throughout our trekking. I guess he wanted some milk from his mom. We were back at the main camp several minutes later. It was indeed one of the most unforgettable rides of my life. The ride was fun, exciting and scary all at the same time. 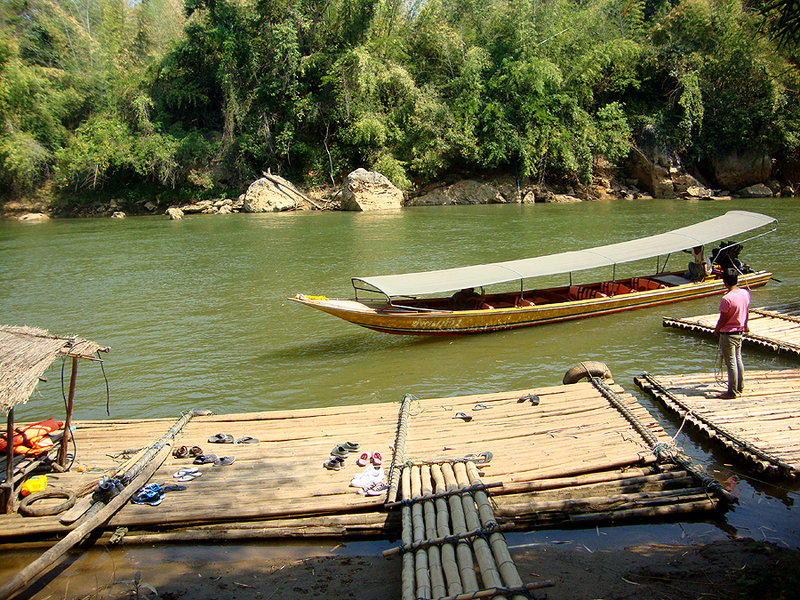 After the elephant trekking, we proceeded to the bamboo rafting in the River Kwai. 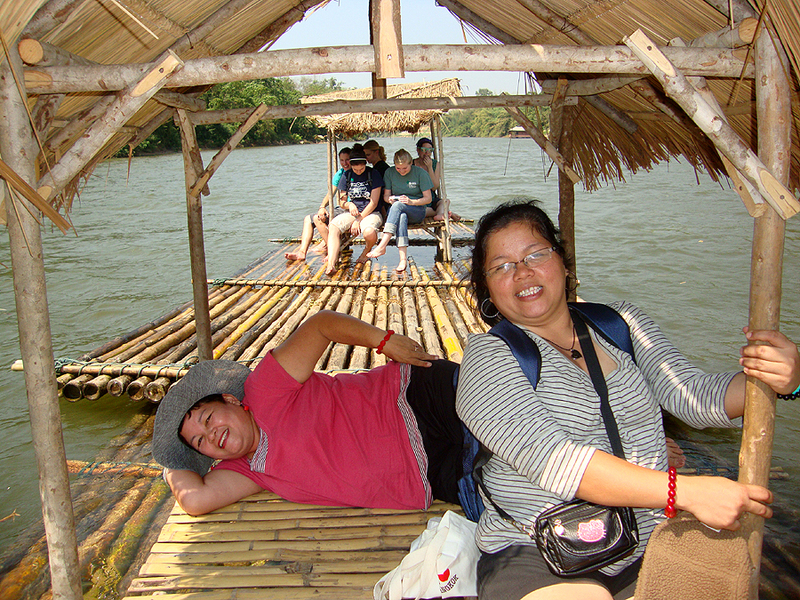 The bamboo rafting was also included in the tour. 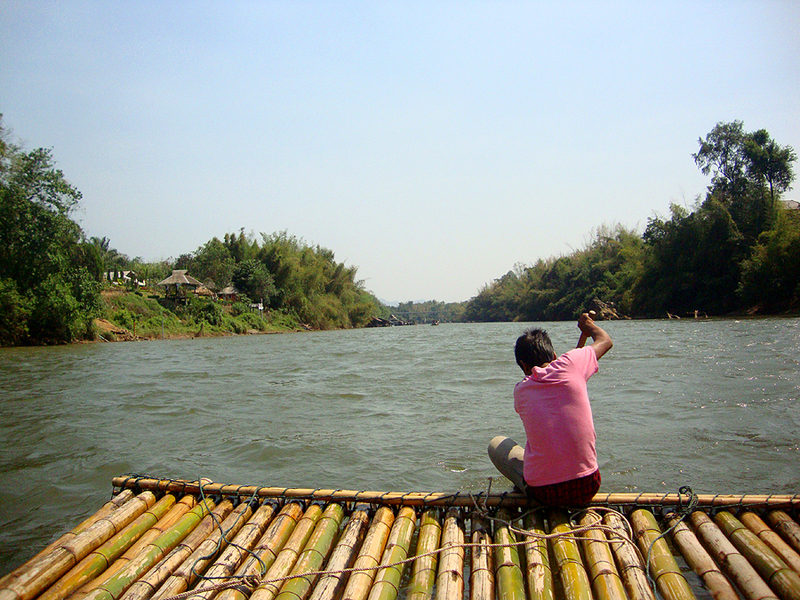 We first rode a speed boat, then we transferred to a bamboo raft and paddled back on the river. Bamboo rafting on the River Kwai was pretty relaxing. The water was cold and the fresh air was soothing. I suddenly felt the urge to sleep on the raft. 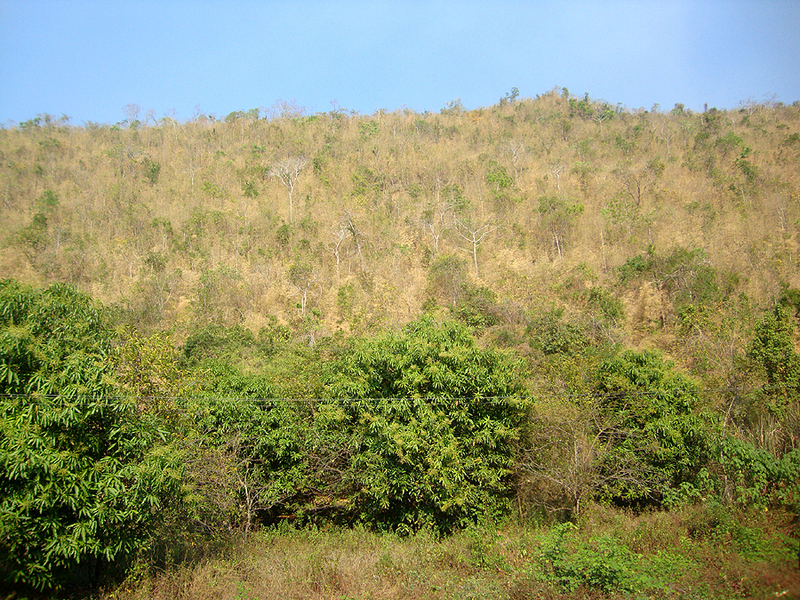 It was great to experience the countryside in Thailand. We were already famished when we came back to the van. It was past noon already and we ate our lunch at a restaurant nearby. Lunch was also included in the package tour so we didn’t pay for anything except for the bottled sodas that my sister and I ordered. However, lunch was very simple and they served mostly rice and vegetables. But because I was very hungry, I ate lots of vegetables. 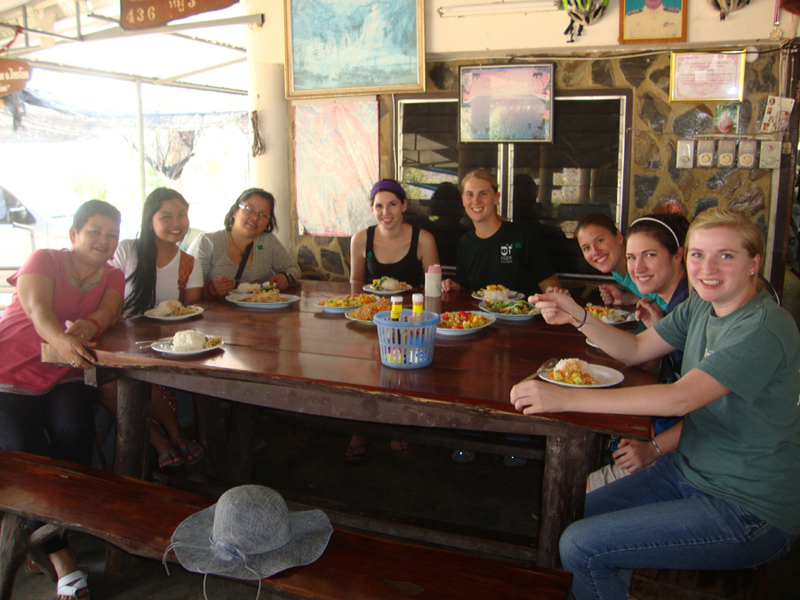 We shared a table with American ladies who work as English teachers in Vietnam. They just came to Thailand for a vacation. 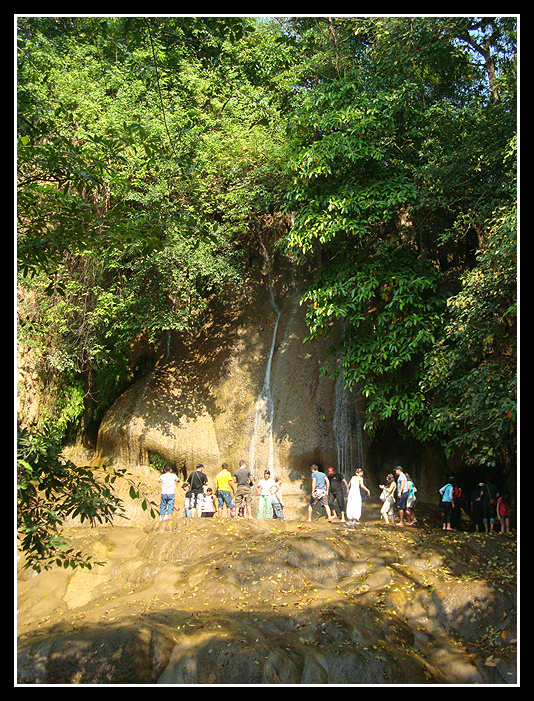 After lunch, we visited Sai Yok Noi waterfall. It’s a beautiful waterfall in Kanchanaburi Province. There were many tourists when we arrived, so I just took a picture of the waterfall from afar. Next we went to the train station and waited for the train to arrive. 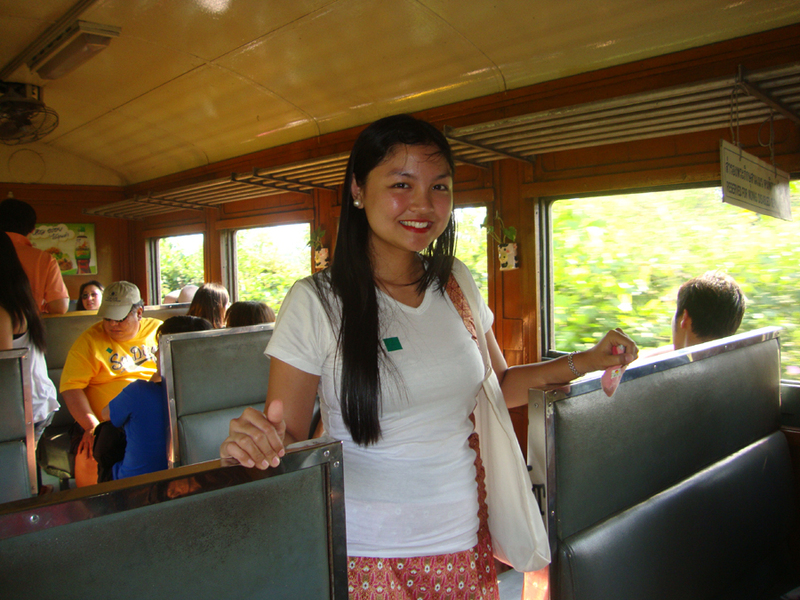 The train ride along the Death Railway (Thailand-Myanmar Railway) was also included in the itinerary. The railway is now closed but a portion of it is still in use nowadays. We got on the train and looked for a seat. The train was full of Asian and Western tourists. 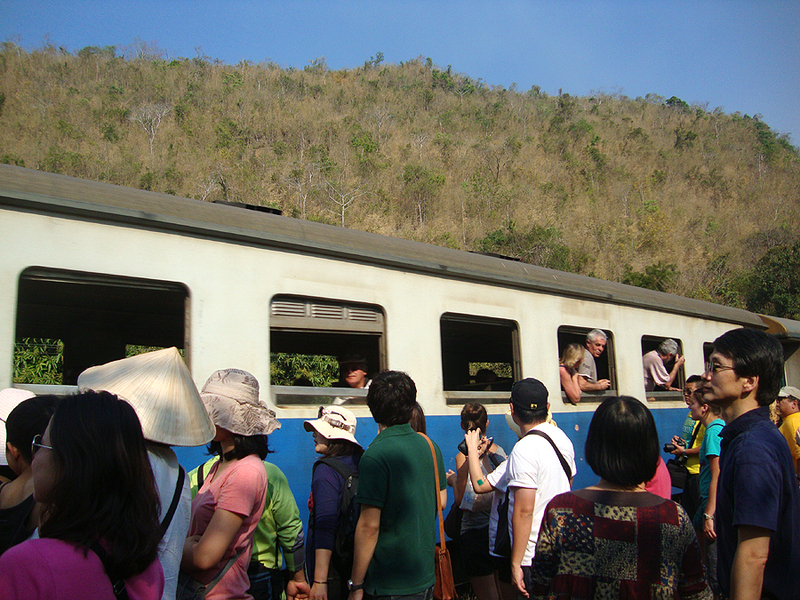 After a while, the train started to move and we watched the picturesque sceneries from the train’s window. 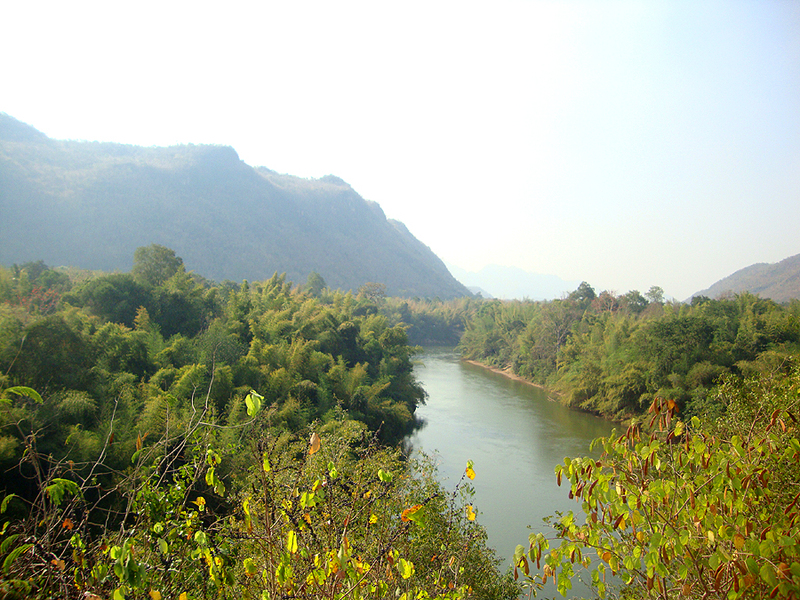 We saw mountains, rocky hills, plantations and the beautiful River Kwai. 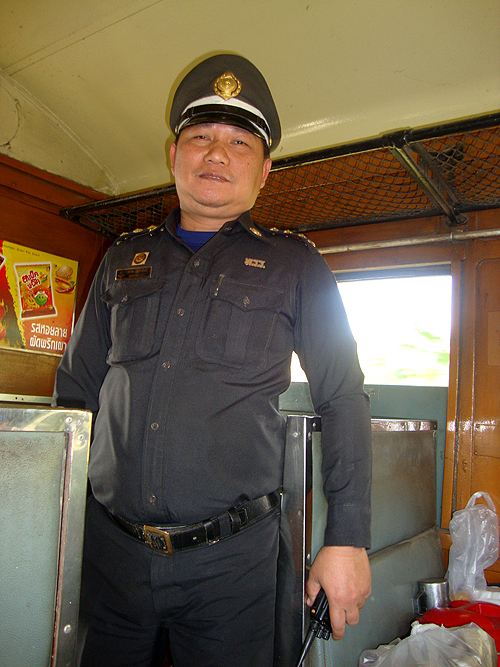 While on the train, I noticed that the train’s captain and our tour guide were looking at me. Our tour guide suddenly approached me and asked, “Where are you from?” I replied, “I’m from the Philippines.” She jokingly said, “No. You’re a Thai!” and I just smiled at her. I was not surprised anymore because I think it’s already the nth time that a Thai had mistaken me as one of them. It’s actually one of the reasons why I love traveling in Southeast Asia. It’s very easy to blend with locals. And I really love it whenever a local mistaken me as one of them then talk to me using their native language. We were picked up by the van after the train ride. 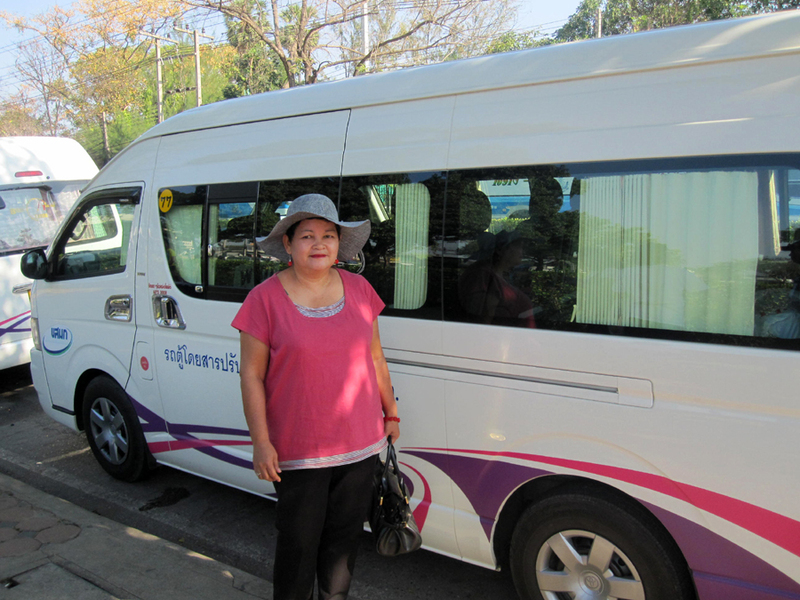 It was already 5pm when we left Kanchanaburi and we started the long drive back to Bangkok. 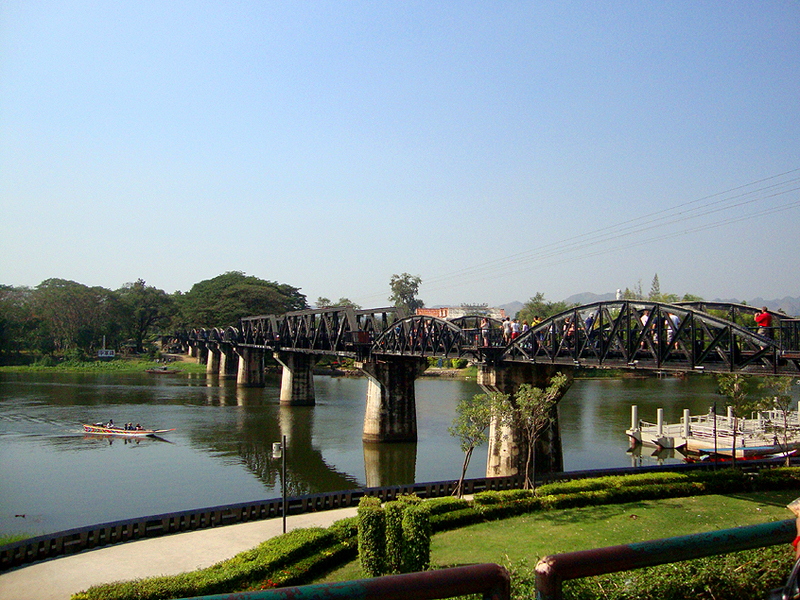 I was really glad I visited Kanchanaburi. 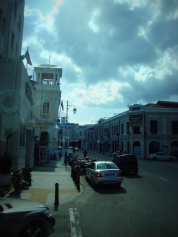 It’s a beautiful province where nature and history blends. We arrived in Bangkok at around 7pm and we proceeded to the airport right away, because our flight back to Manila would depart at 12 midnight. 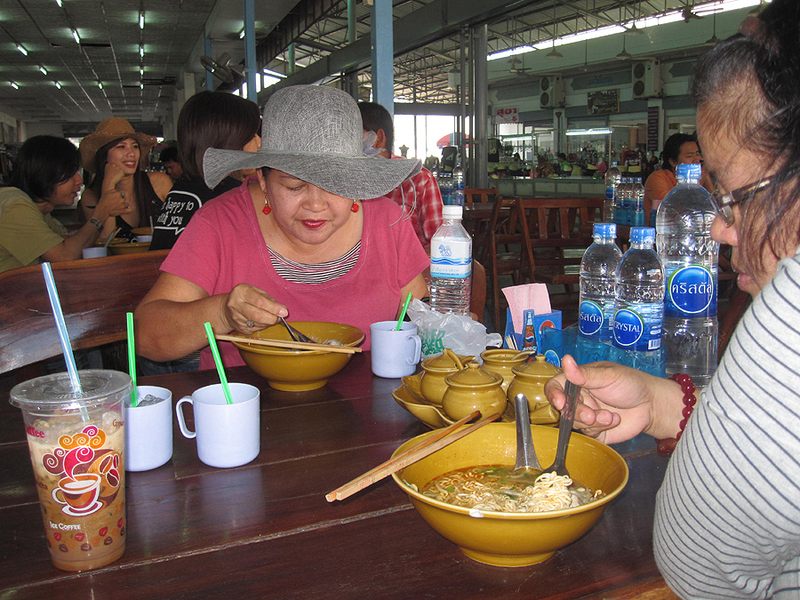 Upon arrival at the airport, we still had a couple of hours to take our dinner and eat our last Thai meal. The food was really delicious! 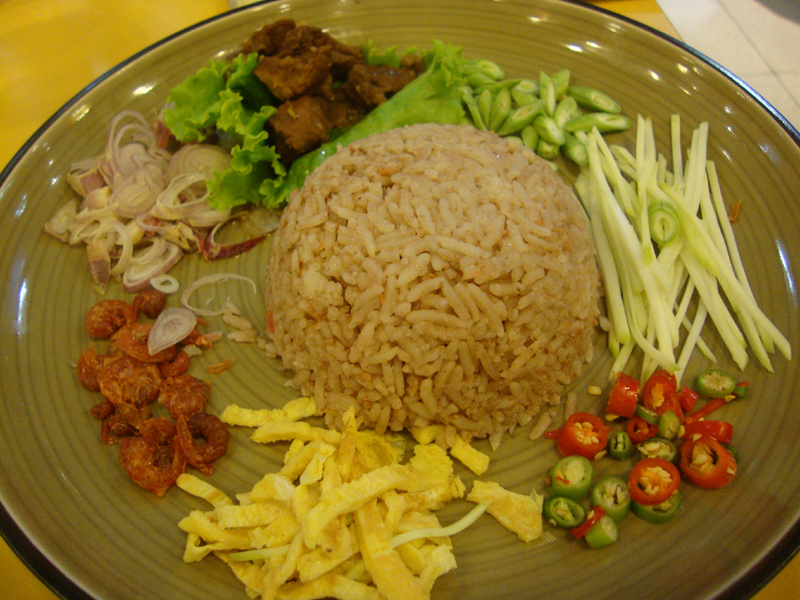 I would always love to go back to Thailand for the uber-delicious Thai cuisine. Our one-week trip to Thailand and Laos was one of the most unforgettable trips I have ever had in my life. What made it extra special was I shared it with my older sister and my mom. Since I was the one who planned and spearheaded this trip, I felt accountable to my family’s safety the whole time. That’s why I thank God for keeping us safe all throughout this trip. Indeed, God’s greatness is immeasurable. And He will give you all the desires of your heart as long as you put your faith and trust in Him. I also would like to thank my mom and my sister for their patience and trust in me during this trip. I knew for a fact that they were very much exhausted after this trip. We crossed the border from Thailand to Laos, rode a bus to the mountains of Vang Vieng, got lost in Vientiane, explored the majestic Grand Palace, got lost again in Chatuchak weekend market, and journeyed the province of Kanchanaburi. Despite the limited budget and some mishaps along the road, I really appreciate it na game na game sila kahit san ko sila dalhin. 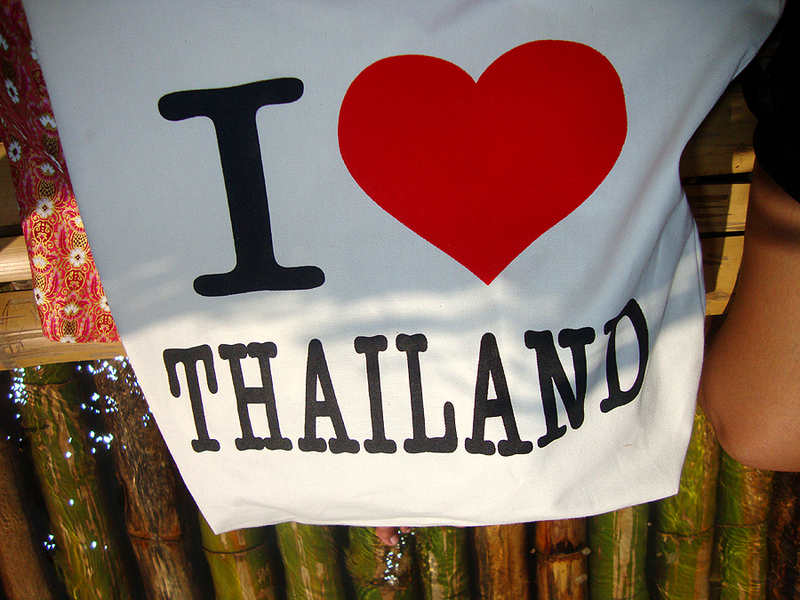 I would definitely come back in Thailand to explore other regions of the country. You can’t just get enough of Thailand. The knowledge and lessons I learned from this trip are truly priceless. Farewell Thailand and till we see again! 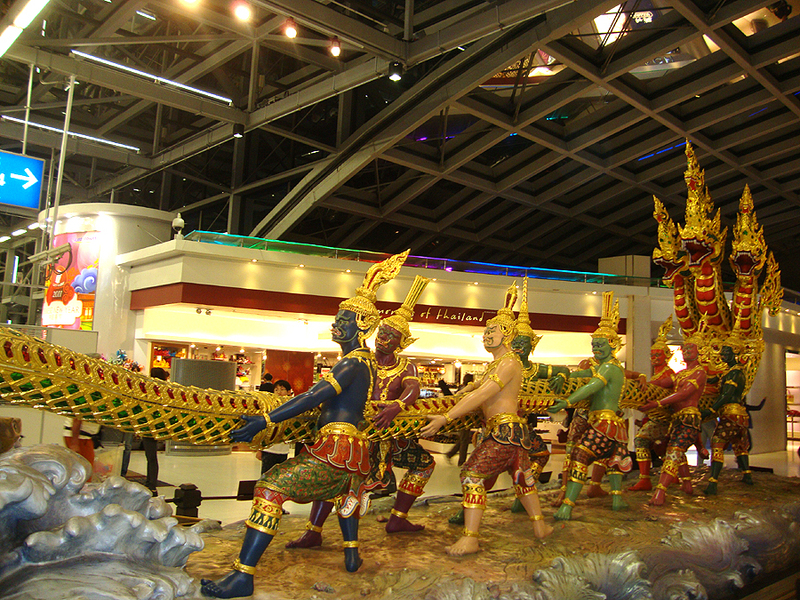 *This post is part of my one-week trip to Thailand and Laos last January 2011. 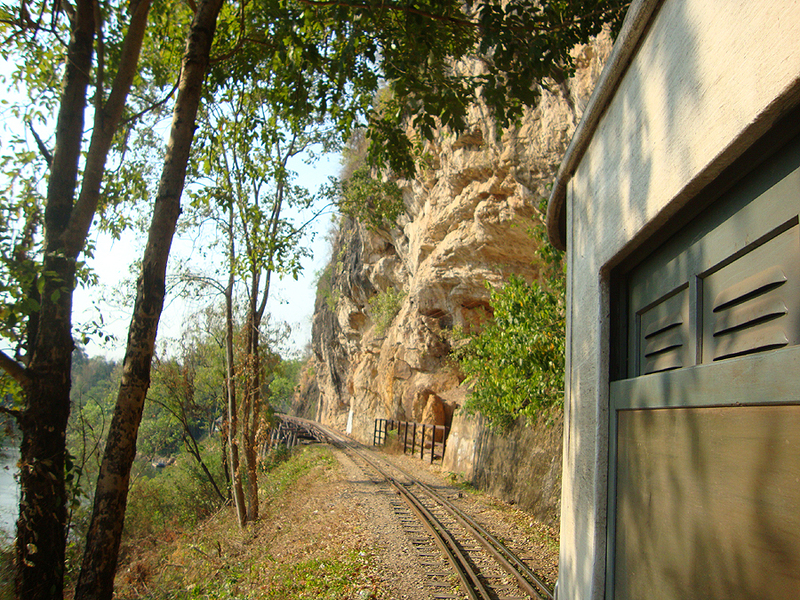 This entry was posted in Thailand and tagged Death Railway, Kanchanaburi, thailand, travel. This looks like a very full-on day. You obviously have lots of energy! Thanks for sharing your interesting photos and describing your experiences. happy travels! every street food in thailand is yummy! kakamiss haay! it feels that I’m there together with you on your trip.I love how you narrated your adventure,Lovely.Btw I have never been to Thailand but to tell you thats one place in Asia I really want to visit.i’M fond of watching horror Thai movies too.Their culture is really interesting and you made me crave to learn more about it..
Glad you came across those elephants…hehehe haven’t seen one.. The pictures are as perfect as the weather. Lucky you, Lovely! Salamat na naman sa pag-tour mo sa akin sa bansang ito. That’s a pretty sweet deal! I have never ridden an elephant. Maybe someday when Luna’s older. The views from the train ride looks really awesome and ewan ko if it’s the same train (yung white and blue) ang sinakyan namin from BKK to Aranyaprathet border. and wow, grabe yung nangyari sa Death Railway ah. exciting trip! 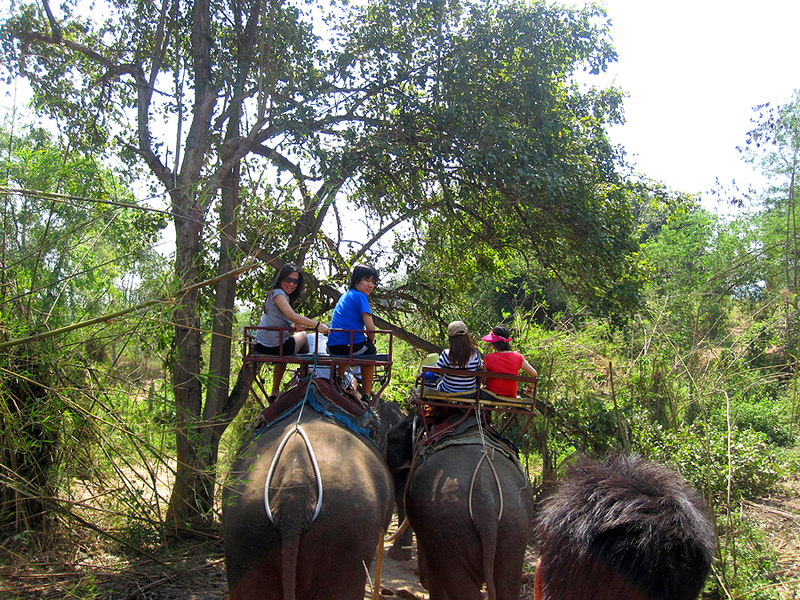 the elephant & train ride was such an authentic way to experience thailand. very nice! I remembered my first trip to Kanchanaburi, Thailand. It was such a great place to visit. Buti nga game na game yung mom and sis mo unlike my family na who couldn’t wait to get back to the hotel after our Tiananmen Square adventure in China. The Death Railway was the first ‘real’ train experience I had before embarking on other memorable train rides- Shinkansen in Japan and Trans-Mongolian Railway in Mongolia. Looking at your pics now, I miss Pad Thai already. yum! I enjoyed reading your blog. 😊 I’m already planning my first Asian Travel Adventure. You gave a lot of ideas. Thank you so much for sharing! Wow! You did the two things that I failed to do during my six-month stay in Thailand. 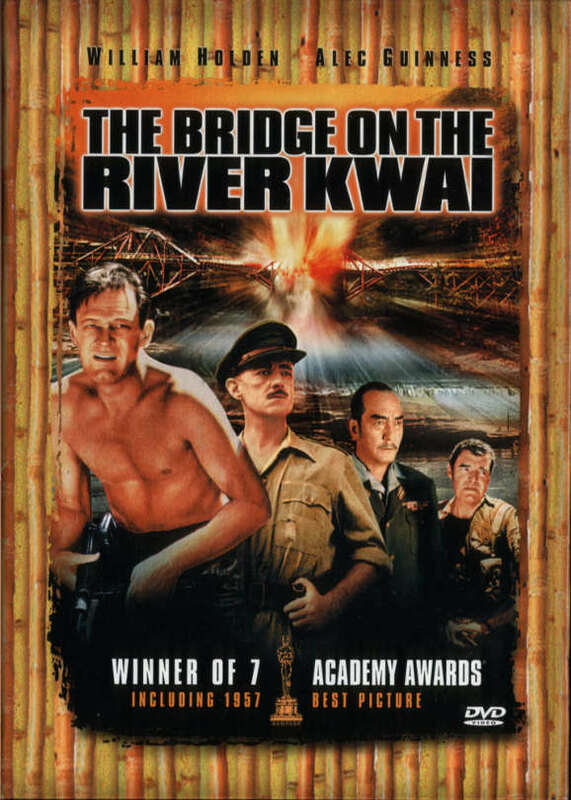 Those are riding an elephant and visiting the bridge of River Kwai. I hope to do that in the future. Awesome Travel Photos you have here. Three thumbs up!